There I was, ya see. Just minding my own business. I just happened to glance over the side of the boat. There he was, chasing me, with a twinkle in his eye. He wasn’t four feet behind the boat. I wasn’t looking to catch a fish today, but who turns down fresh Mahi Mahi? A.K.A Bull Dolphin, A.K.A AHI. I didn’t believe it worked. He was right underneath my fishing pole on the starboard side. I released the friction on the reel and less than four seconds later, Pete, the Mahi Mahi bit down hard. I pulled slightly to set the hook, and the fight was on. All I had to do was literally reach down and grab old Pete. It was too easy, no fun, so I actually let him run about 200 feet out while I hove-to with the boat. Then I tired him out and brought him on board. Pete was 40 ” from head to tail. Now he’s a little less, and a whole lot skinnier. Tonight, we shall feast on Pete. Swells: East at 1-3 ft.
Today has been a beautiful day so far. In fact, it has been ideal. The morning started out a little rough and windy blowing 15-20 knots. By noon the sun was out, the seas were calm, the wind had dropped to eight knots, and we were on a broad reach at 4-5 knots. It was a perfect day for lounging and swimming. I realize, as I head farther north, the weather will become less desirable. But for now I’m perfectly content to ghost along at 2-3 knots in the sunshine. What a difference between the trip to Hawaii and this trip so far. The trip to Hawaii was cold, windy, rolly, and wet. It wasn’t a bad trip, it just wasn’t what I thought it would be. This seems to be the consensus. I have added my daily menu to the items at the top of the page. Food always seems to be a topic of conversation at cruiser gatherings. Cruisers always dream and tell stories about the fantastic meals they are going to make or have while underway. They stock the boat up with all of the various ingredients for these dream meals, often printing recipes and placing next to the ingredients. To many, the food is just as important as the trip itself. Me, not so much. I never know what I will crave or what the seas conditions will enable me to make. My approach is simple, but not economical. I go to the store and buy everything in sight. Whatever sounds good at the time and lots of variety. So far this has worked out well, because I generally have anything I can think of on board. The downside is, my menus are based on what needs to be eaten before it goes bad. Which is why I will eat four mangos, three oranges, and a tub of yogurt for the day. Dave and I were craving chili the other day, but you can’t purchase cans of pre-made chili in Mexico like you can back home (and if you can find some Hormel or something similar, it’s ridiculously expensive), so we decided to make our own using our pressure cooker (PC from here on out). We looked online for an easy recipe and kind of used bits and pieces of different recipes based on what we had in our pantry. We didn’t have kidney beans, so we found a recipe that called for black beans. But then we realized we didn’t have any canned black beans, just dry beans. So we had to pressure cook the black beans first for about 20 minutes (8-10 minutes to bring the PC up to pressure and then an additional 10-12 minutes of cook time). Brown meat; remove (top); saute onion, garlic, bell peppers (san seeds) :-p (bottom). Next into the PC was a can of tomato paste. At this point we also added in something like three tablespoons of red pepper flakes, a good couple shakes of ground cumin, and a little chili powder. 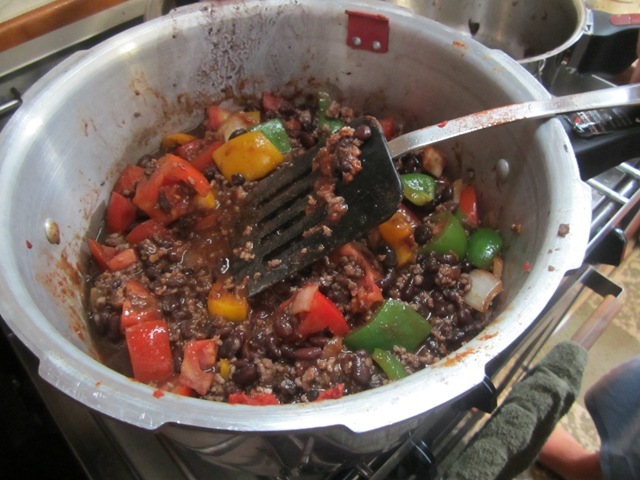 Get all that mixed together well and warmed and then add back in the ground beef and black beans. 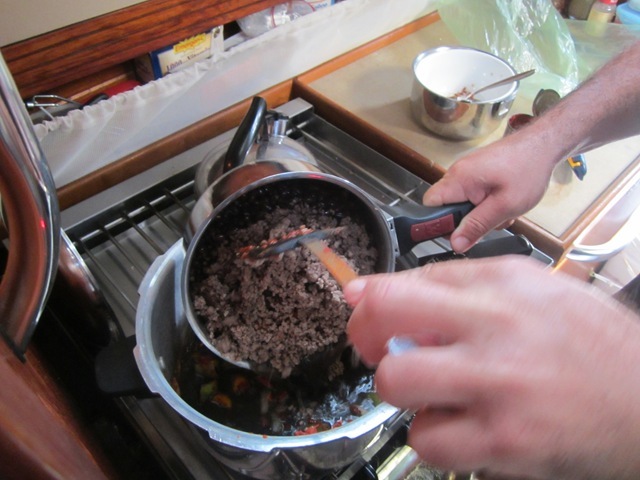 Tomato paste, seasonings (top); add back in the beans and meat (bottom). We didn’t have any cans of diced tomatoes, but we had fresh ones, so Dave cut up three tomatoes into pretty good-sized chunks and tossed those in. We thought a can of corn would also go with this concoction, but lo and behold, after months of me saying, “We have SOOOO many cans of corn!”, we finally ran out of canned corn and couldn’t add it in. Not too bummed; we’ve been noticing ears of corn at the local markets recently, so we may just have to start eating fresh corn on the cob now that the cans are gone! Add in tomatoes and then mix well. Final look before the lid went on. 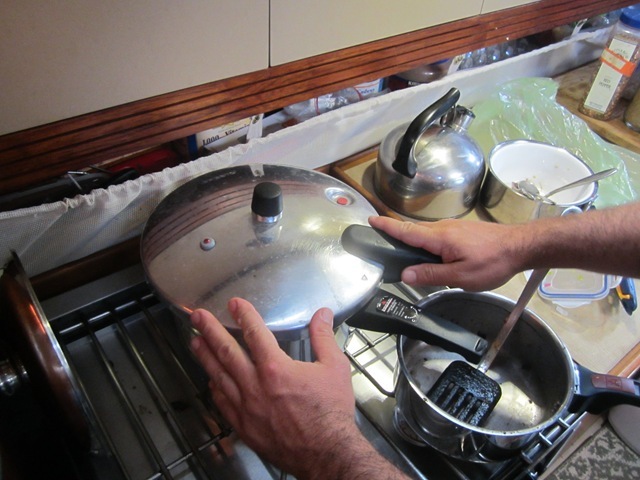 Next, we closed the lid, brought the PC up to pressure on a high flame and let it do it’s thing for about 35 minutes. 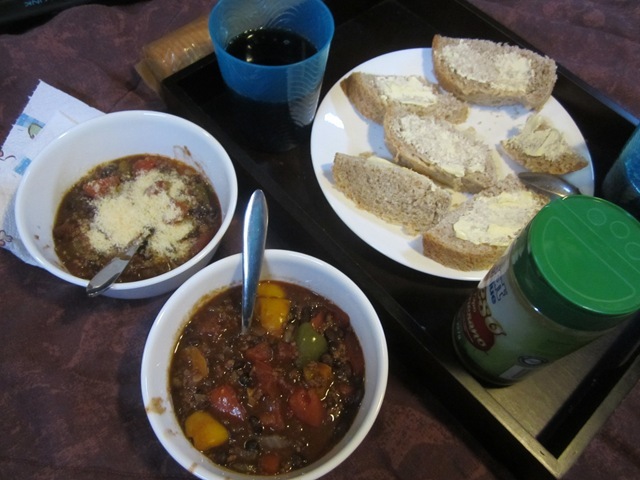 This paired really well with Dave’s home-made pressure-cooker bread, which we’ll have to give the recipe for later. 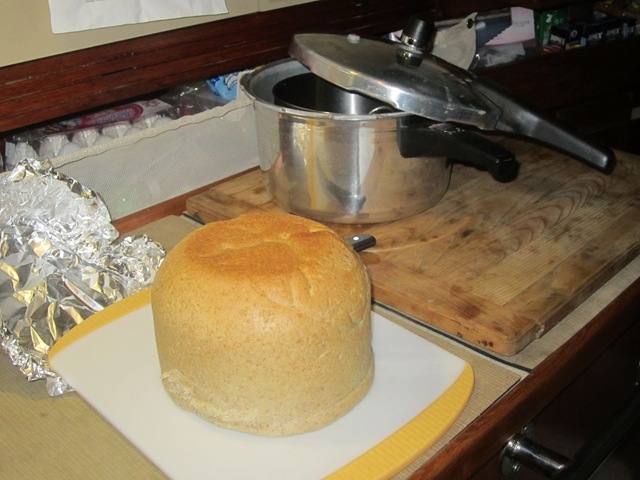 Dave’s pressure-cooker bread; fresh outta the pressure cooker! SO big! Eatin’ good here on Camano! I was recently asked to show some of what we eat on board the boat. We’ve caught some fresh fish along the way and I even bought some JUST CAUGHT shrimp from the Mercado del Mar in La Cruz a couple days ago, which I made into a pasta dish, but I didn’t take photos of deveining and shelling the seafood, so I’m going to give you an idea of what happens on non-fresh days. Most of the time, right after breakfast, we assess if we need to pull something out of our freezer to defrost for dinner. I say most of the time, because there are definitely days when we forget, especially when we’re in great places with great local food. Maybe we’re subliminally sabotaging dinner so we make ourselves go ashore…. Yesterday I realized that we’d put a roll of Farmer John’s mild ground pork sausage in the fridge a couple days earlier. It was still good, but we don’t like to let any meat sit in the fridge too long. It’s a deep fridge; if you think you’ll get back to something, most likely you discover it weeks later hiding in the bottom corner. Usually I use the ground pork in a meat sauce for pasta, but I’d just made pasta the night before with our fresh shrimp (seriously, need to remember to show you how I deveined those suckers), So, what to do? Make sausage? Put it with what? I’m not very clever in the kitchen. I like a recipe to follow. Luckily we have internet access at the moment, so I typed in ground pork recipes and came up with a bevy of info. 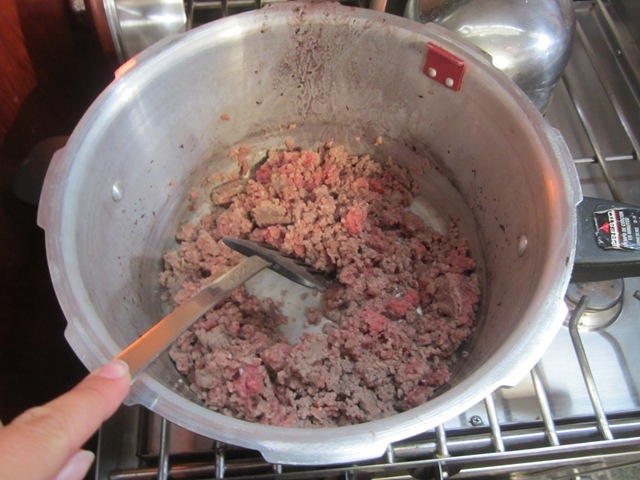 Mainly, that I can probably substitute any recipe calling for ground beef with the ground pork. Nice. I’d just bought fresh heads of romaine and I had some green onions that needed to be used plus a head of garlic that had seen better days (but still edible…it’s all about finding what needs to be used pronto on a boat!). So I thought…maybe some lettuce wraps with some crumbled pork, browned with green onions, garlic, and some diced up bell peppers. I’d had something similar once at PF Changs a long time ago…something about the crunchy lettuce wraps sounded really good. But…my man can eat…so WHAT ELSE to pair it with??? I opened our pantry and started rummaging. I felt a box in the back and pulled in forward. It was a box of Trader Joe’s quinoa (pronounced keen-wha) that our HaHa crew had bought and never used while they were on board. I’d never had quinoa let alone cooked it, but the directions on the box sounded super easy (just like rice, but faster). I figured the pork dish would work with a little carb something or other, but if we didn’t like the quinoa, then I could just roll the pork into tortillas. Dave likes anything with a tortilla. Come to find out – Quinoa? – DELICIOUS. I boiled it in water with a chicken bouillon cube and then let it simmer for 15 minutes until all the water was absorbed. Dave and I really enjoyed my little makeshift, smorgasbord dinner. The pork concoction was super tasty on its own, but the quinoa made it a little more filling, plus it ended up pairing with the pork really, really nicely. 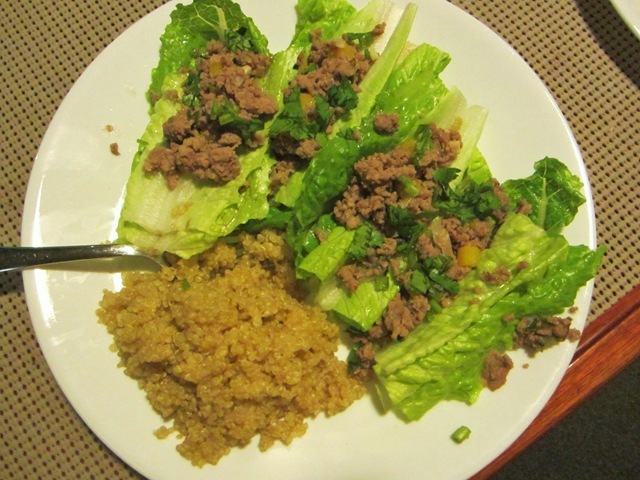 Monday night’s dinner…Pork lettuce wraps with a side of quinoa. Today for lunch I reheated the leftovers (the pork and quinoa all together) and put it on tostada chips. Great leftovers! Super filling lunch with the quinoa. 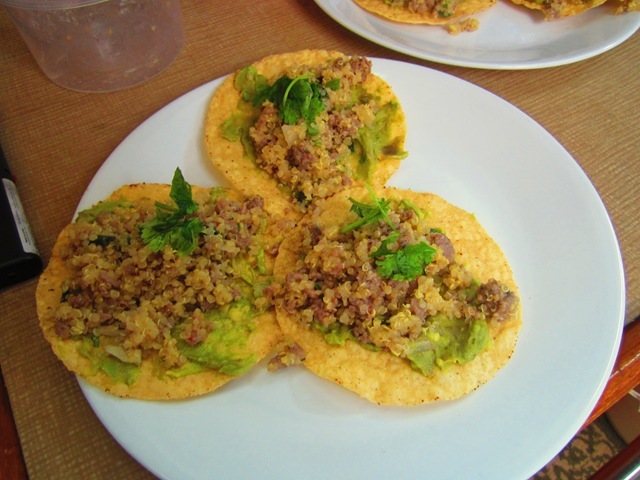 Tuesday’s lunch…ground pork and quinoa leftovers on top of crispy tostadas. Fresh guac is spread on top of the tostada and then the pork/quinoa on top of that. Super duper tasty. Here’s the basic recipe. Let me know if you try it and/or if you have suggestions for next time! 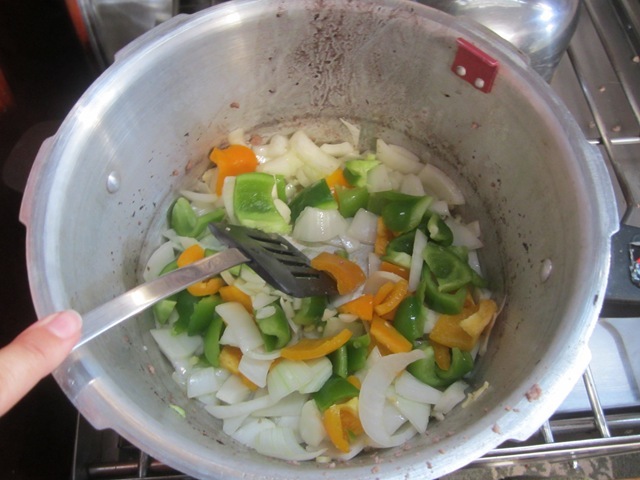 -Diced green, red and/or yellow bell peppers…really just for color, so whatever amount you have. -1 cup of quinoa; cooked as box directs. 1) Cook quinoa according to box directions. Mine was one cup of quinoa with two cups of water. I added one chicken bouillon cube with the water. 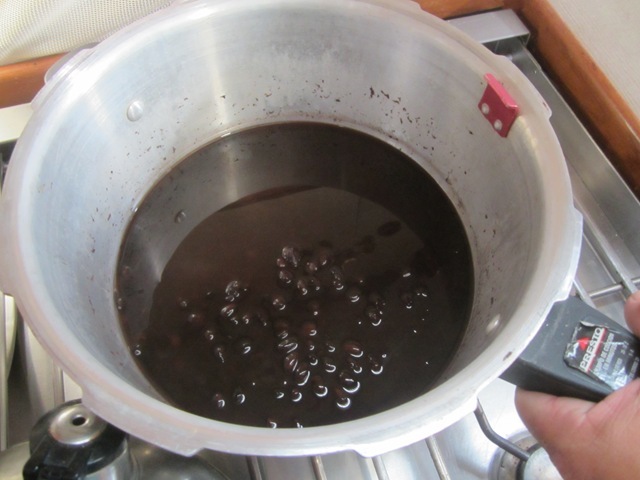 Bring to boil, then lower heat & cover pot to simmer for 15 minutes until all the water is absorbed. 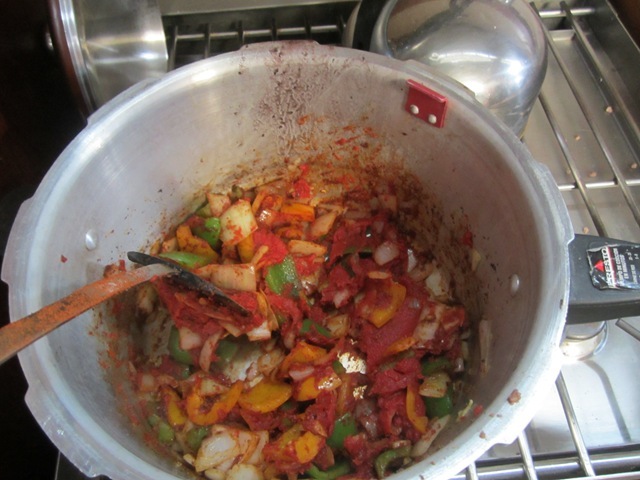 3) When the meat is pretty much cooked, add in the bell peppers so they can warm up and soften a bit. 5) You can serve the quinoa on the side of the lettuce wraps or you can add it into the pork mixture and serve together. 6) Top lettuce wraps with cilantro and/or fresh guacamole for fun.